This is no gimmick. Luxury Swiss Watchmaker Raymond Weil is very serious when it comes to creating watches inspired by legendary musicians. Time and time again they have proved this to us with watches like Tango 300 “Bob Marley”, The Freelancer “David Bowie”, and Maestro The Beatles “Abbey Road”. Raymond Weil’s latest musically inspired timepiece pays tribute to one of the greatest rock bands of all time: AC DC. This limited edition watch, which was first shown at Baselworld, measures in at 42mm and exudes a notable air of masculinity. True to its Rock and Roll influence, the hours have been marked with studded indexes. 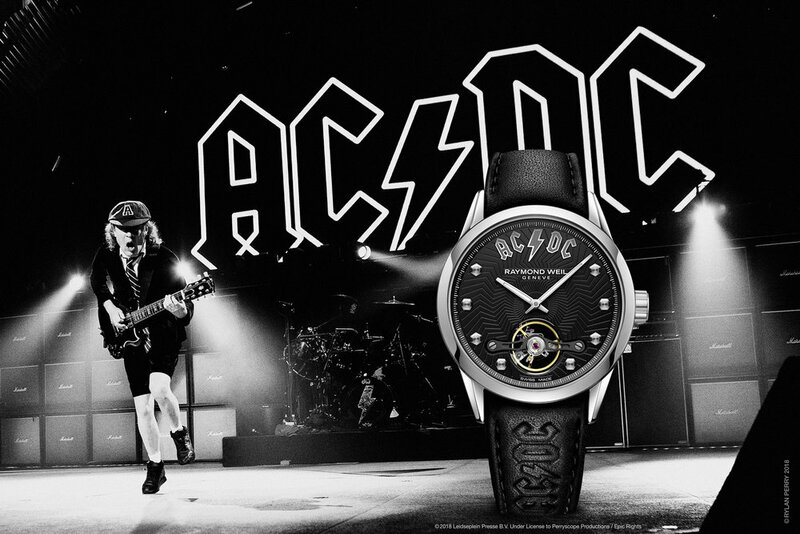 The limited-edition timepiece rock and roll aesthetic is highlighted further by the prominent black lather trap and the AC DC logo found at 12 o’clock. Beyond the surface lies the 3000 pieces and the Caliber W1212 self-winding movement it took to create this marvel. Each Raymond Weil AC DC Freelancer watch will come with a certificate of authenticity. For more information on the watch, be sure to visit the Raymond Weil site.